We spent only a short time in Phaestos and Malia, but we collected around 60 different marks cut into the building blocks in Phaestos (after our friend Lanny North spotted the first one) and about 30 in a shorter time in Malia the next day. When we had visited Knossos the day before going to Phaestos, we had not been aware of the possible existence of the symbols, and had not seen any (though Hood lists many more from Knossos than from the other two sites). We were not able to visit Zakros or Aghia Triada. (Note: Like many Greek place names transcribed into English, Phaestos has many spellings--Festos, Phaistos, and Phaestos being among them. 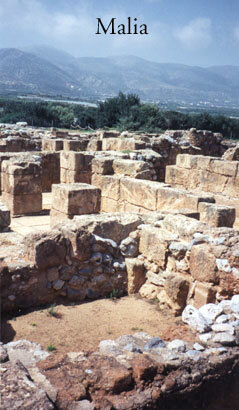 I chose Phaestos because that was the way it was spelled on our road map. Similarly, Malia is sometimes spelled Mallia). 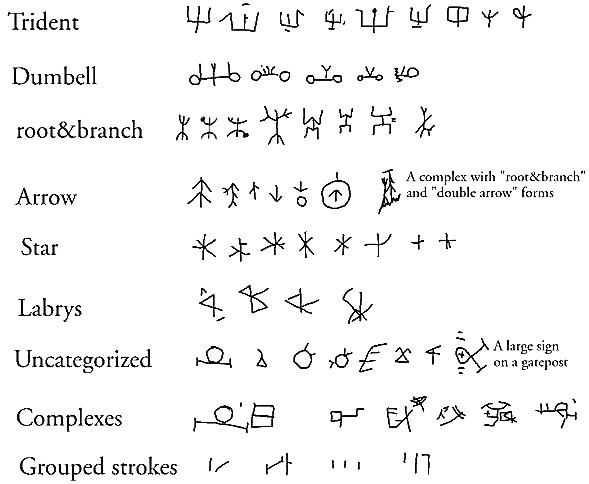 The so-called Mason's Marks, found in the Minoan palaces at Knossos, Malia, and Phaestos, were listed and enumerated by S. Hood ("Mason's Marks in the Palaces," in "The function of the Minoan Palaces: Proceedings of the Fourth International Symposium at the Swedish Institute in Athens, 10-16 June 1984", Edited by Robin Hogg and Nanno Marinatos). 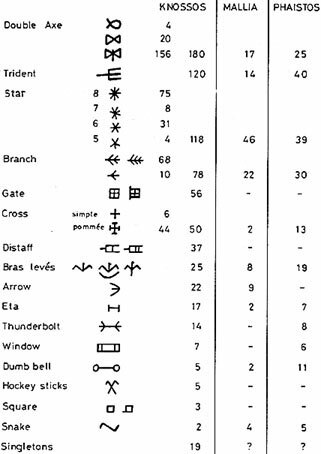 In a search of the Web, this is the only reference I have been able to find that includes pictures of what is claimed to be a comprehensive list of symbols. In the museum at Malia, there is a display of some of the symbols found there and at the other palaces. Everything else on this page is my personal observation and speculation. The observation is factual, the speculation should be taken with large doses of salt. The Mason's Marks must be dated some time before 1650 BC, which is now thought to be the approximate date of the huge Santorini (Thera) volcanic explosion that preceded the demise of the Minoan civilization. According to Hood, the deeper cut and larger marks, such as those in the accompanying photos, are older. 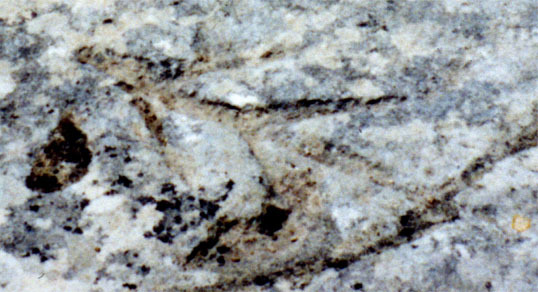 The more lightly incised and smaller marks (often hard to trace) are younger. The marks discussed here are all of the large, deeply incised, type. 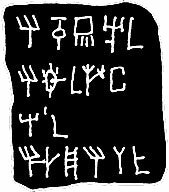 I saw only one stone (of a different, dark, mineral, that had small lightly inscribed symbols; that stone was very hard to transcribe. So the marks discussed here may be from some time around 1800 BC. To show what the deeply cut Mason's Marks really look like, here are some photos of a few of them, mostly from Phaestos. Below the photos are three tableaux: Hood's list of symbols, and my sketches of marks copied from rocks seen during our visits, first at Phaestos, and then at Malia. (You can see larger, cleaner looking, versions of each tableau in a separate window by clicking on its title or on the tableau itself). You can use the photos to see how accurate (or otherwise) my sketches tend to be. Each photo is captioned by the location of the sketched symbol. Click on any small photo to see a larger version of it. This symbol is on a gatepost. It is roughly 60 cm high. The fourth row of Malia complexes may have Hood's "snake" as a component, but Hood seems to show the snake as isolated, which I did not see in either Malia or Phaestos. His "thunderbolt" is exactly the Chinese character for "tree" and has many variants--at least at Phaestos. I saw only one "labrys" (double axe) on a vertical surface--the second in top row of the Malia tableau, oriented as shown. I assume the other labrys-like symbols should be similarly oriented. 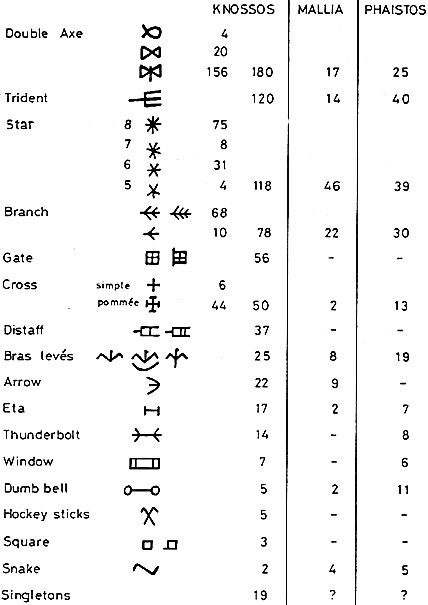 It is hard to reconcile the set of symbols I collected from either palace with Hood's list. Unfortunately I did not record which symbols were seen many times and which were seen once only. But it is clear, for example, that tridents, as well as symbols with circular components, occur much more frequently in Phaestos than in Malia. 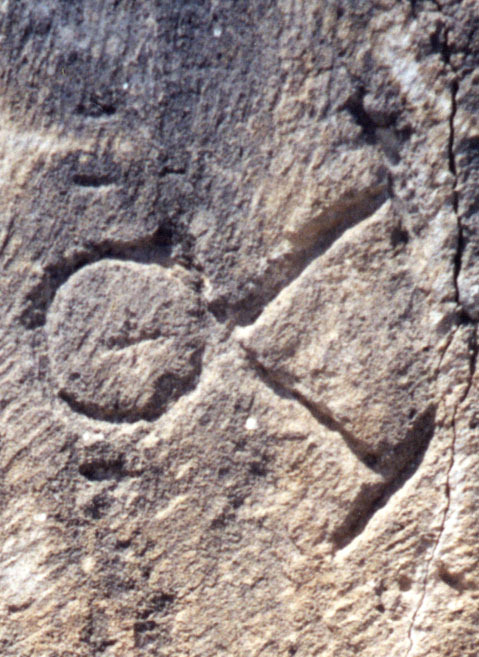 I saw only one, oblique, trident and no circles in Malia, though both tridents and forms with circles were quite common in Phaestos. On the other hand, forms based on a triangle (including the so-called "double axe" that features prominently in Hood's list) are much more common in Malia. 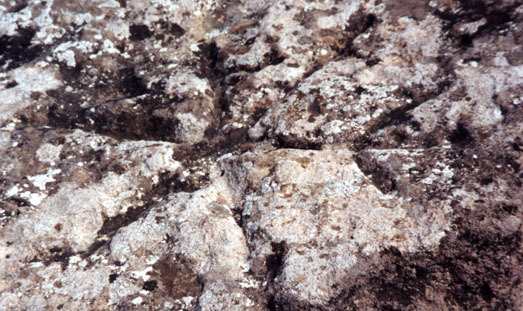 In the individual palaces, marks of a given kind seemed to congregate near to each other, though this might be a sampling artifact or due to the placement of the stones by the archaeologists. 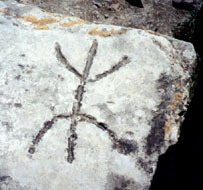 Some of the symbols were cut into the visible face of the stone, but some were hidden in the interface between stones. One I found in the eroded interface between stones of a gatepost (end of a wall) and could transcribe only by feeling between the rocks with my hand. So the marks were not all intended to be seen or read by the inhabitants of the palaces, though they were seen by the builders. According to the discussion that follows Hood's paper, the marks are not writing at all, but they look like it to me, for reasons adduced below. 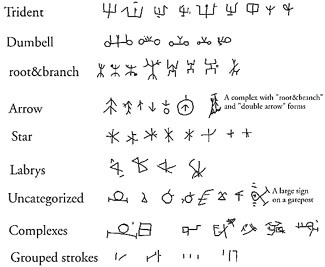 Iit seems likely from the different kinds of variation on basic forms that the symbols were more than unique arbitrary patterns. They seem to be modulated forms, perhaps like the Chinese "radical and phonetic" combinations, or perhaps syllabic combinations, and thus to be a form of writing. 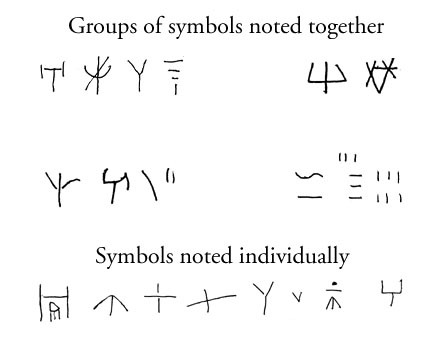 Indeed, some of the symbols appear also in Linear A and Linear B, which definitely are writing. Arrowheads seem to be a common addition to a basic sign. 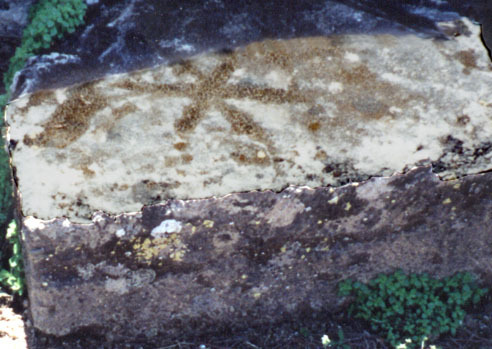 Stars often have one or more arrowheads added (see the three right-hand ones in the second row of Malia symbols for examples). A single line or "bar" extending from the middle of a symbol to one side seems to be another common modifier. It appears also on characters on the little Knossos bar and the little black tablet shown below. Sometimes the "bar" is ended by a T-bar, sometimes not. The "double axe" form is shown by Hood with the two triangles oriented horizontally. However, the only one we saw on a vertical stone face in situ was the second from the left in the first row of the Malia set. One common line of the two triangles is oriented vertically, so the "handle" of the double axe points up and to the right (this example also has an arrowhead on the "handle").The "handle" looks to be the same as the line or bar modifer mentioned above. 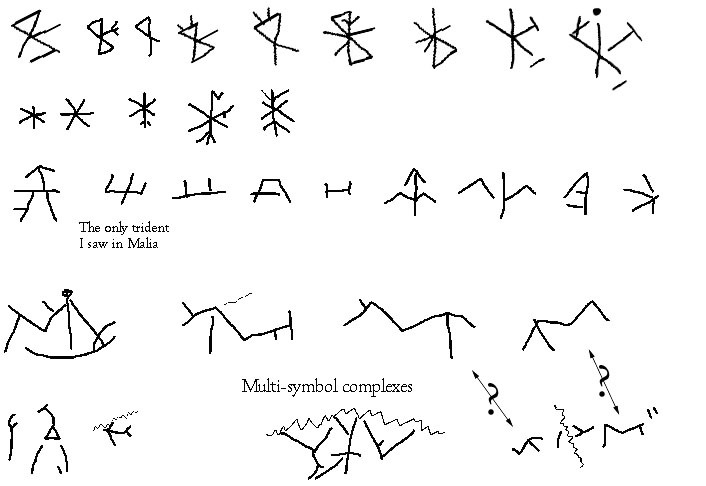 Given this, and the number of variants in which one of the triangles is not closed, and it seems likely to me that the "double axe" symbol has no connection with a physical double axe, however important that object was to Minoan culture. Several symbols appear in both Phaestos and Malia, as well as in other writings from Knossos or Zakros (as seen in the Heraklion museum). Here is an approximately life-sized copy I drew from a small black bar from Knossos, which contains a triangle with a curved spike coming out of the top. 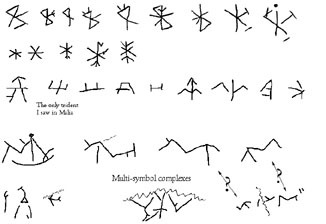 That symbol is in both the Phaestos and the Malia lists, though the Knossos example has an extra line like the "double-axe handle". That extra line is seen on several of the Mason's Marks, and may relate to the "right bar" modifier on three symbols of the black tablet shown below (see below for a discussion of possible modifiers in the construction of the Mason's Marks). The second-from-right symbol in the bar also occurs at Phaestos, and perhaps the plus sign and the arrow are the same as their Phaestos counterparts. Two more examples of similar writing in the Heraklion Museum. At left is my drawing of a small black tablet in the Heraklion museum. Unfortunately, I did not record where the tablet was found. The drawing is perhaps a bit bigger than life-size. Looking at it, one is very tempted to see it as a poem, considering the repeated use of the oblique trident on the left of the lines and in the middle of the bottom line (and the square trident on the third line and fourth on the first line). 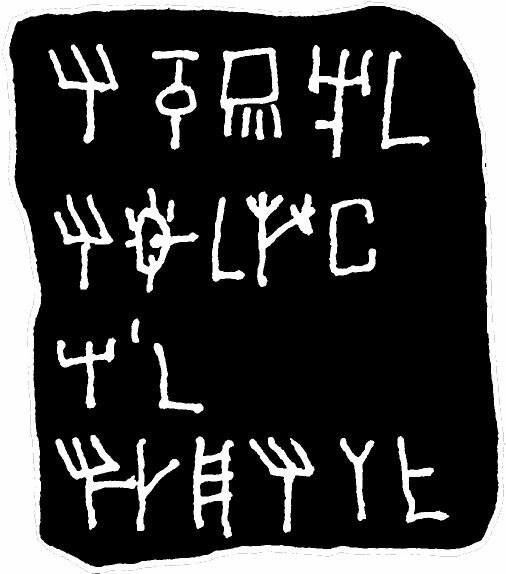 The "L" shaped symbol appears at the right end of the second and fourth lines and in the middle of the second line, and with a "right-bar" modifier (which appears in three symbols on this tablet) it appears also at the right end of the fourth line. Notice in relation to the argument above, that on the second line the fourth symbol has two of the "modifier" arrowheads, as compared to the second symbol of the last line..
Below is a drawing I made from a pithoi (large pottery container) from Zakros (the fourth Minoan palace on Crete). 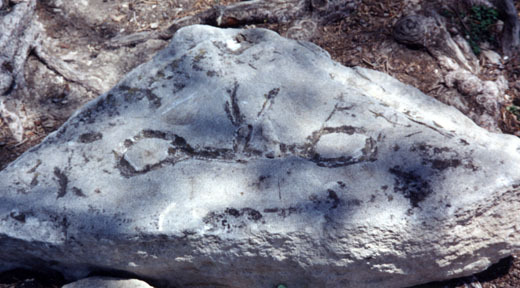 This two-line inscription was written near the top of the pithoi from Zakros. Presumably it records the contents and/or ownership of the container. Being written on clay, the act of making the marks was much easier than on stone. Nevertheless, it has several of the Mason's Marks, for example in the top row the bare trident, the second and third symbols from the right, and perhaps the fifth from the right. In the bottom row, the leftmost, the sixth (i.e. 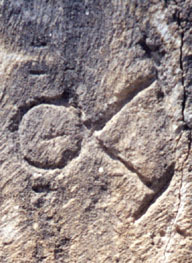 the bar carrying a circle), seventh ("Psi") and ninth ("Psi-bar") symbols were seen cut into stone in Phaestos or Malia. For good measure, I include some symbols written on clay objects (tablets, and a jar) from Akrotiri, seen in the Santorini Archeological Museum in Fira. The upper four groups were written as groups, perhaps representing phrases. The bottom row consists of some other symbols noted one at a time. These were all transcribed very hastily in a quick pass through the museum. 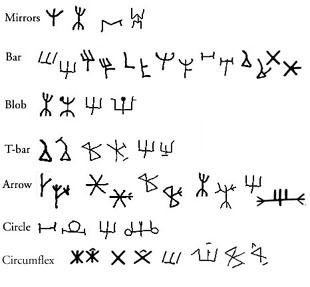 The upper right group is interesting, as it seems to combine a variant of the trident so common in Phaestos with a complex variant of the Phoenecian ox, which became the Greek Alpha and then our "A". 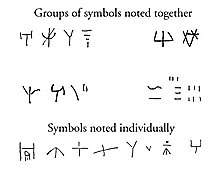 Several of the other symbols can also be seen in either the Malia or the Phaestos set. 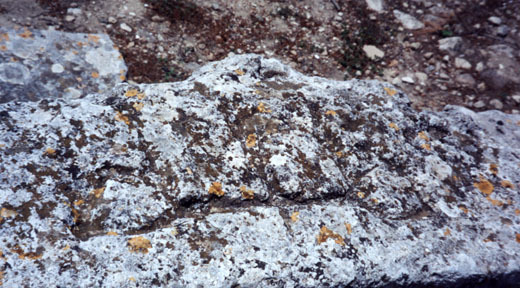 The bottom-right group looks as if it represents numbers, as does a group at the upper left of the inscription on the Zakros pithoi. In the bottom row the second-from-left symbol is on Hood's list of Knossos symbols, but was not seen in Malia or Phaestos, though it is in the set of symbols displayed in the Malia museum. It appears also (in a combined form) in the second symbol from the right in the bottom row. Mirror-doubling (creating the "double axe" from a triangle, or the "root and branch" from a "Psi". Adding a single circle on the middle of a line, or two circles at the ends (seen only as a modifier to the "Trident"). (Compare the last pair of symbols in the "Circle" row with the last pair in the "Arrow" row). Circumflex added above a symbol (I say "above" because in Hood's Figure 6, he shows a photograph of a "gate" symbols on a door jamb, with the circumflext clearly above it. Of course, other symbols might have had it in a different orientation). There are other possible modifiers, as one can see by looking at the various Phaestos tridents or the Malia labrys. Indeed, it is not clear that the trident itself is a unitary symbol, since "bare tridents" with no "handle" are not uncommon. The "bare trident" may be the basic symbol, with the "handle" being a "bar" modifier.